﻿Trip & Fall Accident Cases Caused By Ice & Snow: Who Is At Fault? - David I. Pankin P.C. Home Personal Injury ﻿Trip & Fall Accident Cases Caused By Ice & Snow: Who Is At Fault? One common question that arises is: when does an injured party have the ability to be compensated for their injuries by a slip or fall accident on a snow covered or icy sidewalk? Proximate Cause – the dangerous condition caused by the breach of duty must have caused the accident. In New York City, “[t]he owner or lessee of property abutting a public sidewalk is under no duty to remove ice and snow that naturally accumulates upon the sidewalk unless a statute or ordinance specifically imposes tort liability for failing to do so” Bruzzo v. County of Nassau, 50 A.D.3d 720 (2nd Dept. 2008). The New York City Administrative Code Administrative Code § 7-210 [b] imposes tort liability on commercial property owners, for injuries arising failure to maintain a sidewalk “in a reasonably safe condition,” including the “negligent failure to remove snow [and] ice,” See Gyokchyan v. City of New York, 106 A.D.3d 780 (2nd Dept. 2013), Harakidas v. City of New York, 86 A.D.3d 624 (2nd Dept. 2011). It should be noted that this law contains an exception that it shall “not apply to one-, two- or three-family residential real property that is (i) in whole or in part, owner occupied, and (ii) used exclusively for residential purposes.” NYCACA § 7-210 (McKinney’s 2015). Regardless of the exception above, if any property owner, residential or commercial, engages in snow and ice removal activities, that owner must act with care that is reasonable under the circumstances. That owner must avoid creating a hazardous condition or making the naturally occurring hazard created by the storm even worse. See Fernandez v. City of New York, 125 A.D.3d 800 (2nd Dept. 2015); Espinell v. Dickson 57 AD 3d 252 (1st Dept. 2008). “[E]ven if a storm is ongoing, once a property owner elects to remove snow, it must do so with reasonable care or it could be held liable for creating or exacerbating a natural hazard created by the storm” Arashkovitch v. City of New York, 123 AD3d 853 (2nd Dept. 2014). This includes the residential homeowners exempted by New York City Administrative Code Administrative Code § 7-210 [b]. See Cuapio v. Skrodzki 106 A.D.3d 769 (2nd Dept. 2013). In slip and fall cases caused by snow and ice on sidewalks in New York City, there are additional requirements as required by the jurisprudence of the Supreme Court, Appellate Division, First and Second Department. New York has what is called the “storm-in-progress rule.” This rule makes it must more difficult for injured parties to bring a slip and fall case caused by ice or snow on a sidewalk. It states: “[a] person responsible for maintaining property is not under a duty to remove ice and snow until a reasonable time after the cessation of the storm.” Wei Wen Xie v. Ye Jiang Yong, 111 A.D.3d 617 (2nd Dept. 2013). See also Pippo v. City of New York 43 AD 3d 303 (1st Dept. 2007). The case of Wei Wen Xie v. Ye Jiang Yong illustrates this rule. In that matter, the plaintiff was injured in a snow and ice slip and fall accident in front of defendant’s property at 8:15 a.m. The defendant was able to establish that it had not stopped snowing until midnight the night before the accident. See Wei Wen Xie v. Ye Jiang Yong 111 A.D.3d 617 (2nd Dept. 2013). As guided by the “Storm in Progress” rule, the court held that because the accident occurred before the defendant had a reasonable amount of time after the cessation of the storm to remove the snow and ice in front of the property, there was no liability. 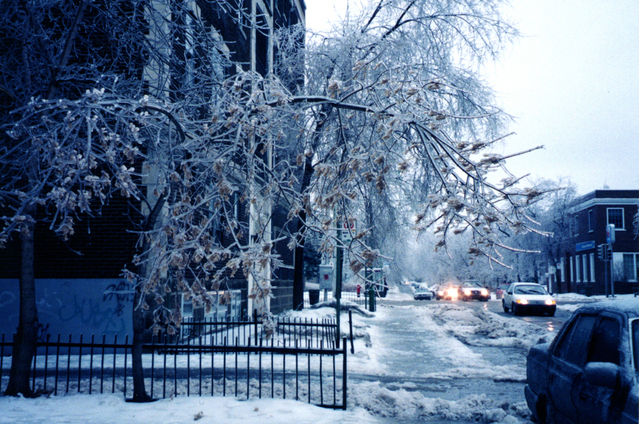 In calculating what is a reasonable time to perform snow and ice removal, the courts will often look to New York City Administrative Code Administrative Code § 16-123[a] which states that “owners of abutting properties have four hours from the time the precipitation ceases, excluding the hours between 9:00 p.m. and 7:00 a.m., to clear ice and snow from the sidewalk” See Schron v. Jean’s Fine Wine & Spirits, Inc., 114 A.D.3d 659 (2nd Dept. 2014). It should be noted that 16-123[a] only regulates snow removal activities and confers a civil penalty, but does not in and of itself create any tort liability. A redirected storm gutter that allows ice to accumulate in a pedestrian area. If you are injured by a slip and fall accident this winter, please make sure you seek immediate medical attention for your injuries. Please make sure you document your claim, if possible, take photos and talk with any witnesses to your accident. Finally, make sure you contact the experienced personal injury lawyers at the Law Offices of David I. Pankin, P.C. for a free consultation to evaluate your potential matter. Our firm has 20 years of experience handling snow and ice related accident cases. You can reach anytime at 888-529-9600 or by filling our one of our easy online contact forms.